This goes into some detail about what is involved in a filibuster in Texas and State Senator Davis’s experience with this particular one. I watched some of this live (though didn’t get to the feed until after Wendy Davis was done speaking for the night) and found it exhilarating. This seems to me a great write-up of at least the part(s) that I saw. I realize recipes that are quick or easy or both are understandably popular for both sharing and using! The one below is not exactly either one—there’s a fair amount of prep work chopping chicken and vegetables, and the whole thing takes a while to marinate. So I don’t claim either ease or efficiency in offering this recipe. :) Rather, it is for occasions in which one might want to actually spend some time cooking just the right thing or want something a bit elaborate for a summer meal. Sometimes, the opportunity may present itself to set aside some time to do something we love. If cooking is one of the things you love, this recipe is for you. When I cook (which I love to do), my tendency has long been to make things up. I rarely follow recipes, preferring instead to take whatever I have in the kitchen and combine it in a way that seems intriguing or appealing to me. Sometimes this works, sometimes it doesn’t. ;) That is how this recipe came about…in fact, I had to specifically make it again in order to measure the ingredients, since of course I had not ever done so! This is also how I tend to write. Even if I have an outline or an idea of how a story is going to go, I’m inclined to leave a lot of room for characters to do what they wish (which I’ve found they generally will anyway) and for the story to develop the way it wants. Frequently, thus, I have little more than a rough idea or a vision of a setting or an impression of a character, and sometimes less than that, when I sit to invite words forth. When it comes to marketing, however, planning and organizing move to front and center over spontaneity and flow. Not that marketing can never involve spontaneity and flow, but to me, the process has seemed to require more discipline and direction than the creative endeavor (writing) that may prompt it. Delightfully, there is considerable support out in the online world if one knows where to look. I discovered Marketing for Romance Writers (MFRW) a few years ago when Lisabet Sarai mentioned it in a listserv email for another group. I joined and mostly lurked until earlier this year when there was a call for new assistant newsletter editors to help proofread the newsletter. I answered the call and have since been catapulted into the extraordinary wealth of support and resources that is MFRW. If you don’t know of (or are a part of) MFRW and you write, I highly, highly recommend joining the Yahoo Group. It’s free, and you can customize how you receive messages from the group into a daily digest (so you only receive one email a day) if you prefer not to receive each individual message as an email. You will then have access to myriad discussions on all things marketing, from websites to Twitter to taglines—as well as a place to ask your own questions on such topics as they arise. MFRW’s offerings include the monthly newsletter (check it out here), organized blog hops, and, most notably and imminently right now, the annual MFRW Summer Camp. Summer Camp is an online event that epitomizes MFRW’s motto—”seek, teach, share, learn, succeed.” That’s what Summer Camp is all about, and we’d love for you to be a part of it! It will take place the weekend of July 12-14 on MFRW’s Coffee Times Romance forum. If you want, think of Summer Camp like a weekend of marketing marination that, like this recipe, results in the soaking up of flavors that let you put your best presentation forward. ;) In all seriousness, it is an opportunity to immerse yourself in the business of marketing, learning from all directions about things like promotion, social media, online presence, and how to spread the news about whatever it is you’ve worked so hard to write. The amounts of all the ingredients above may be altered depending on how many people you want to serve. I make this for two people, and we’ve invariably had leftovers. Also, if you especially love any of the above things, feel free to use extra of them! As is probably obvious, a big part of this recipe involves cutting things to kabob size. The mango and mushrooms are already taken care of. With the onion, I just cut it in half and then halves again to about inch-and-a-half pieces. I cut the tops off the peppers, remove the inside/seeds, and cut them into pieces about the same size. Once everything is chopped to skewering size, simply mix the four marinade ingredients together, pour it into a gallon-size Ziplock bag (or bowl if you prefer), add all the kabob ingredients, and let marinate in the refrigerator overnight. (You might want to turn the bag a time or two for even marination.) If you’re short on time, several hours is okay too. 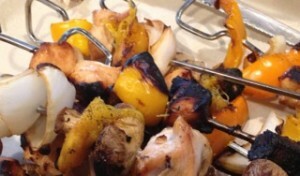 When marination is done, prepare for a big mess in your kitchen and thread all your ingredients onto skewers. I prefer metal ones. If you use wood ones, it’s recommended to soak them in water first (to reduce splintering). I use an outdoor grill to make these. With the grill on its highest heat, lower the grill cover and grill the kabobs for about 8 or 9 minutes, turn them, and grill them for 8 or 9 more. Depending on your grill, the cook time may vary—just make sure the chicken is not pink at all in the middle (or use a meat thermometer, though this is a little harder with such small pieces. It can work if you skewer a few chicken pieces together and insert the meat thermometer through all of them, stopping with the tip in the middle of the final piece…if that makes sense ;)). And perhaps check in on them a time or two while cooking to make sure everything isn’t charring too much, in which case you’ll just want to turn the heat down some to give the chicken a chance to cook all the way through without burning the other ingredients. Nicely put, and an important perspective, I feel. Not being very familiar with Justice Ginsberg, I discovered a subtle tendency for nuance and insight (probably helpful in serving as a Supreme Court Justice!) in this that I much enjoyed seeing. I also found the legal aspects, of which I was also unaware, interesting. I deeply appreciate knowing there is an ally like this in this position to serve as one. I find this a fascinating, thoughtful exposition on something that hadn’t particularly consciously occurred to me—or perhaps it had and I just hadn’t realized it this way. Either way, I really like what Hugo has to say here. I couldn’t agree more. I have long felt unambiguous about using the word “abortion” and saying I support the right to choose it, I support access to it, and I support physicians who perform them. Because I’ve never seen any reason not to (use the word). I find this brilliant and fabulous and could hardly agree more. I am a huge fan of what I interpret as the open, sensible approach I see this taking toward the topic at hand. I don’t quite even know how to say how awesome I find this. I don’t feel surprised by it at all, but I will admit it feels somewhat nice to feel not like the “odd exception” were what I interpret this piece as expressing to be true. In any case, I love the idea of examining this kind of thing more instead of just assuming that what we think we know is the case (especially when, to me, it has so often seemed to not be).